Mom, if you're reading this, there's something that's bugging me. How is it that I'm 33 years old and I've never played a single game of organized soccer outside of gym class? My brothers both played. My son plays. It's actually got the highest participation rate in the country. Everyone, it seems, plays soccer as a kid. Except me, that is. Sure, I had my tee ball and then softball and I played hockey, but how did I completely miss soccer? my answer used to be, "...because i'm heterosexual". but, now my 6 year old son plays, and it's not PC, and i can't respond that way anymore. i have never played soccer. the guys just never, ever thought "let's get the gang together for a soccer game!". we played baseball, basketball, hockey, football, catch (any), cards, talked, sat there, even sat alone at home...but never did it occur to us to play soccer. See Brian, that's exactly what I'm talking about. 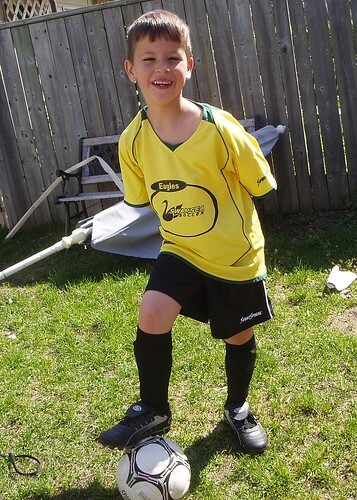 All 6-year old sons now play soccer. What's changed? Not only did I not play, I've yet to sit through an entire televised game. I don't know why my generation or your younger generation dislike soccer, but it does, and our youth is rebelling by playing the blasted game in droves. It must be the "beautiful game". Even I played it for a summer, but it really wasn't my cup of tea, so to speak. Switched to softball the next year and never looked back, so I don't think you missed too much, Mike. Understanding that soccer is a more of a European/African/Asian sport baseball just does't cut it. Don't get me wrong soccer players are probably the best conditioned athelets overall. However, Baseball in Bolton this year has grown from registration from just over 350 players last year to over over 500 this year & we are scrambling to find diamond times. Most of newcomers came from soccer at their young age. I've been on the Executive Committee for 3-4 years for BBall & seen a gradual increase of players to Baseball from soccer & especially lacrosse - another sport which is having problems in Caledon. Soccer here in Bolton has declined to to the point that another league is starting up in competetion with Caledon/Bolton soccer. TOO MUCH POLITICS MUCH LIKE HOCKEY. See you on the diamonds. For you soccer people - diamonds are not a girl's best freind they are a males & your KIDS. See you on the diamonds!!! Here's my theory. Back in the day, men ruled the home. We made all the decisions, especially when it came to what sports and activities little Johnny was going to participate in. Men pushed baseball and hockey and football and "manly" sports like this. Little Johnny wasn't going to play that European sport where you can't use your hands. Then, in the 80s, we worked really hard to eliminate this sexism and mommy started having more of a say in what little Johnny did on a Tuesday night. Mommy, being the sweet, nurturing person she is, doesn't like the violence of football and hockey and the danger of baseball. Mommy likes soccer. The term "Soccer Mom" exists for a reason. It's mom's sport of choice. When men started sharing the power, kids started playing more soccer. It was quite a simple thing. Your cousins were joining a soccer team and their dad talked your dad into letting your brothers play too as they were the exact age that the particular soccer team needed. Thus they played soccer and you did not. You were too old for that soccer team and there were just too many extra curricular on the go and we could hardly fit them all in. Thus you are the only one around void of soccer skills. Sorry Mike. I too never played an... inning? Period? Quarter/half? I dunno. I never played soccer. I did however bowl for 10-12 odd (literally) years in the YBC. I tried little league and curling a couple of times, but I was never very good and didn't have all that much fun. Nah, nah... it's not a man thing... it's a Canadian Man thing... my father was raised by European immigrants (my grandparents) and he got me and my brother into Soccer as kids. I loved it for quite some time, but eventually deviated from it. I rediscovered it in University and LOVED playing it. And to this day, I still play rec soccer on a team with my brother, cousin and friends. It is the world's most popular sport to play, after all.